that thud was the sound of my head hitting the keyboard. for a person who used to bake and sell cheesecakes for a wholesale business, this was not going to be a challenge. 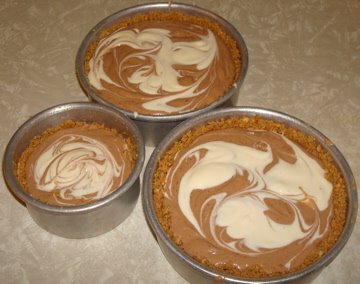 or was it… over the last 15 years or so, i have baked many, many cheesecakes in many, many styles and flavors. i have even done a wedding cake that was cheesecakes. so for me to participate in this months challenge, i needed to find something that i haven’t done before. i thought of many things, ricotta or goat cheese instead of cream cheese. so many chocolates to choose from. fruits of all colors, a quick trip to the liquor store or a search for hazelnut paste…what was i going to do? how could i make this a little different from every other one i have done before? when all else fails and your imagination is at a standstill, just clean out the fridge. or at least stand there while your husband does and you can grab things as he decides to pitch them or you can let that be your inspiration. we had so many little tubs and bowls of stuff piled behind so many half full containers that we could not find anything in there. it was time for all of those lazy squatters to go! first stop was the pantry, i needed a crumb crust. i was in luck, there was a bag of biscotti crumbs left over from something and a partial bag of hazelnut pieces, a little black sugar, some melted butter and voila! a crust is born. in to the cheesecake went some sour cream since we had two open tubs and we were out of heavy cream. 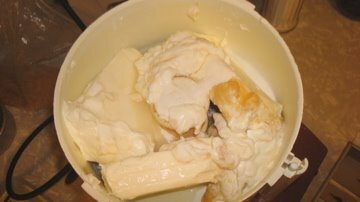 in the freezer i found some bananas that were over ripe and saved for just such an occasion. back into the pantry and my search yielded a little colombian chocolate from the valentino challenge. i flavored the batter with the banana and poured 2/3 of it into pans. 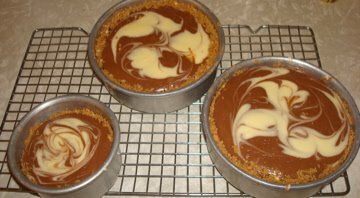 the remaining third was mixed with the chocolate which i had melted and this batter was swirled into the batter in the pans to make a marbled cheesecake. when it was all said and done, the cakes were cold and ready to come out of their pans, i headed back to the freezer and used some frozen strawberries to make a nice sauce. there you have it, banana split cheesecake! it was simple to do and my pantry as well as the fridge and freezer are a little less cluttered! thanks for the challenge Jenny, it was fun! the crust; biscotti crumbs, black sugar and hazelnut pieces, they beat graham crackers every day of the week! 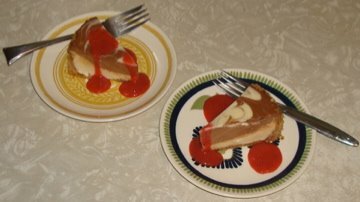 my favorite way to make a cheesecake-in the food processor. the cheese, sugar, sour cream, vanilla and banana will be mixed first with the eggs added slowly last. i decided to share, one 6″ cake for us, one 6″ cake for a friend and one 4″ cake for my neighbors. this is what they looked like before going into the oven. a slice for me and a slice for my husband, a wonderful way to end the evening. We were not hurt by the tornados, about mile from our house. It did some serious damage, but thank God more weren’t hurt. Crazy that we both live in this area. Okay, so I’m over a month late, but I’m glad you still managed to make this challenge even though you sound like a cheesecake pro. I love recipes that let you clear out the pantry.